Just out of curiosity I decided to examine the Birth certificate that the Obama Administration released earlier this week. I downloaded it and magnified it in adobe reader and saw some suspicious aspects around all the lettering. The transparent background was disconcerting and some of the lettering looked strange. I thought some of the print mismatch could be attributed to the form having had pre-printed lettering and filled in with type writer. So I decided to get a closer look. I loaded it into adobe illustrator cs4 to see if there were any layers within the document. 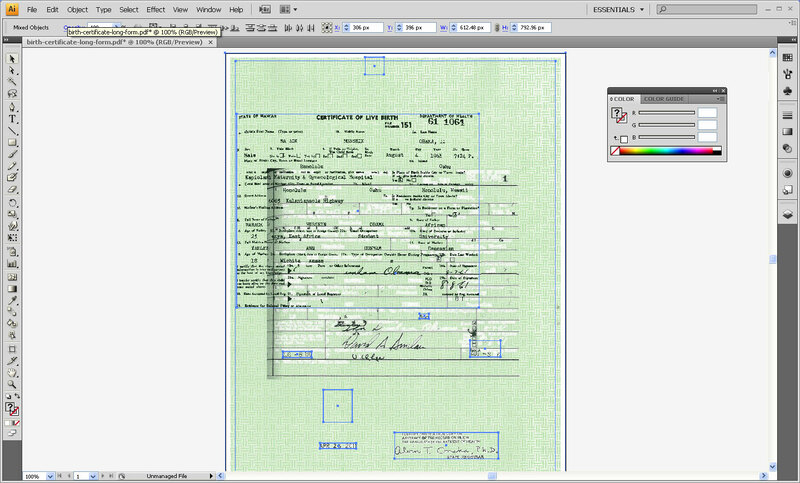 Here is a screen shot that shows the serial number and signatures on separate layers. This is indicative of a document that was pieced together. It looks as if multiple form pieces were assembled into a new creation. I am simply reporting what I found. I am not responsible for this fiasco. Why was there a flight to Hawaii to get this document? It is obviously electronic. If they were getting hard copy it would have been scanned to create the pdf. None of these layers would then exist. An electronic copy could have easily been emailed to the white house. I don’t know what is going on here and I don’t know why this guy’s records have been hidden. Bottom line… These stories do not add up. 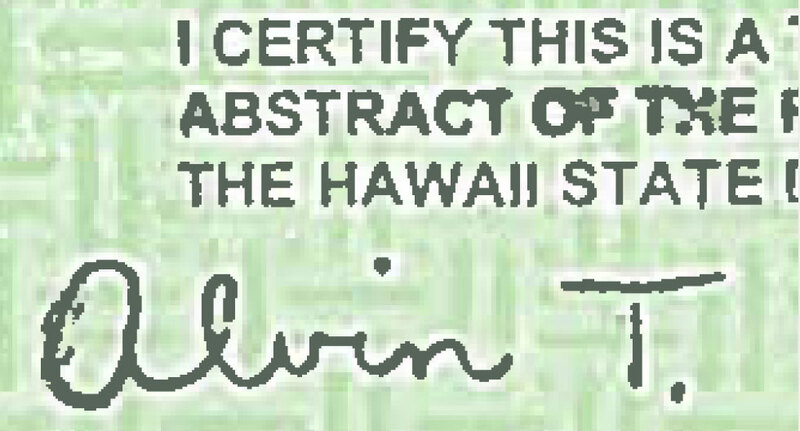 There would be no need to travel to Hawaii to acquire this document. None at all. Update Courtesy of Jerome Corsi: Take a look at the mispelling in the stamp on the bottom right. I have blown it up to 800%. Also, look at the smiley face on the “A” in Alvin. Yes. You read that correctly. We have record low oil prices right now. Let me explain. According to the US Department of Energy gasoline sold for .27 cents a gallon (leaded regular) in 1949. Now in 1949, our money was backed by gold and silver. According to coinflation a silver quarter has a melt value of $8.15. Gasoline at the pump in 1949 was equivalent to $8.80 worth of silver today. At $4.00 per gallon we are paying roughly half the 1949 price. In other words, oil is cheaper in terms of silver. You have the federal reserve to thank for destroying the purchasing power of the US Dollar. Your dollar is losing value. Rapidly. I have heard that gas prices at the pump had an all-time low of around 17 cents in the depression era. I can’t confirm that. However, if we accept that myth as fact and do the math we find that the 17 cent prices equates to about $5.52 per gallon. I must conclude, that we are now experiencing a record low price at the pump in terms of real money. So why does it hurt so much? Everything is increasing in price. The dollar is dying and wages are flat. When wages are unable to keep up with the rate of inflation, a larger percentage of your income is devoted to the products you buy. Ron Paul re-Introduced the American Sovereignty Restoration Act. Since President Obama committed our troops to war in Libya without so much as a courtesy call to the Congress, I would expect your elected officials may be receptive to this legislation. Why does Congress no longer declare war? The UN Security Council has assumed that role. Urge your elected officials to co-sponsor and vote for HR1146 The American Sovereignty Restoration Act. We need to have a say through our Congress whether or not we will commit troops to foreign wars. They are our sons and daughters!!!! This would strike a major blow to The New World Order. A quick read of the text is a lesson in just how entangled we have become. The number of agreements and treaties needed to be nullified just to rid our nation of UN influence is remarkable.